Swallowing a sword is one of the most uncomfortable sensations the human body can possibly experience. A 24-inch metal blade is wedging its way down your esophagus, between your lungs and nudging aside your heart. Your body constantly wants to gag as saliva is trying to trickle down your lungs. The sword could impale your heart, killing you instantly. And because no nerve endings exist beyond your upper throat, you can’t actually feel the blade once it gets down to the bottom of your stomach. And you’ll have “sword throat” afterward from the abrasions and scrapes. So who would actually choose to make this his or her career? For good reason, there’s only about a dozen professional sword swallowers today. Dan Meyer, once a scrawny, soft-spoken kid who was endlessly tormented at school, is now a seven-time Guinness World Record holder and president of the Sword Swallowers Association. It took him several years and 13,000 unsuccessful attempts, but now, he can swallow swords underwater; he can swallow 21 swords at once; he can swallow a red-hot sword, heated to 1,500 degrees Fahrenheit. And he has no plans to quit. Based in: Michigan City, Indiana. But I’m moving to Florida soon. Graduated from: I studied music business at Waldorf College, a 2-year college in Iowa. Then I traveled to India as a missionary, came back, and got a degree in music business from Indiana State University, where I majored in the harp. Previous jobs: After graduation, I moved to the Bahamas for seven years, where I was the caretaker on an island and wore a loincloth and ate lobsters. Then I moved around to Nashville, Stockholm and London, where I had jobs in copyright licensing in the music business. None of which are exactly natural precursors to a career in sword swallowing. They’re not as far apart as you might think. I finally moved back to Nashville, which is where I got into [sword swallowing]. Putting my show together is like a musical performance – the intro act, building up to the finale. Did you dream of doing this as a kid? I grew up with social anxiety disorder, low self-esteem, an inferiority complex and fear of rejection. I was a scared, shy, skinny, wimpy kid who was tormented by bullies. So I vowed that I would one day do things other kids couldn’t. I watched Ripley’s Believe It or Not and read about Guinness World Records and saw real people achieving real feats. So in college, I learned how to juggle, ride a unicycle, and eat glass and fire. Then one day, after I had moved to Nashville and was running a jugglers’ club, a guy showed up at the club who was a sword swallower. He made it sound so exciting that I decided to learn how to do it, too. How does one go about learning to swallow swords? For four years, I practiced 10 to 12 times per day, every day. I had 13,000 unsuccessful attempts before I got my first sword down on February 12, 2001. It took me another two years to do it consistently without gagging, and another five years to do it with multiple swords. Eventually, I did it underwater in a tank of sharks and stingrays for Ripley’s and won the Guinness World Record. Now you swallow swords full-time. I travel to 25 countries per year, performing at top colleges, youth groups, festivals and fairs and scientific medical associations. I don’t practice as much anymore; it’s become second nature, like riding a bike. The longest sword you ever swallowed: 38.5 inches for Stan Lee’s Superhumans series on TV. It was red-hot – 1,500 degrees Fahrenheit – and I could only keep it down a few seconds before the heat transferred down the blade. It’s about 20 inches from the bottom of your stomach to your teeth, so most people start out with a 15-inch dagger for the first four years and then graduate to a 22-inch or 24-inch blade. Getting it down without puncturing a lung seems terrifying. Physically, you need to flip open the epiglottis and place the sword just right so that the blade goes past the pharynx, down the esophagus and between the lungs. Then you need to nudge the heart aside with the blade – the heart literally leans on the sword – so the blade goes through the diaphragm, past the liver, and into the stomach to touch the bottom of the stomach. One wrong move, and you could puncture any of those organs. (It typically takes a month to overcome each bodily reflex.) If my posture isn’t quite perfect when the sword nudges my heart, it can sometimes cause what feels like an electric spasm in my body, and I sometimes see stars. Other times, if my posture isn’t quite right, the sword sometimes hits and bruises internal organs, which can really throb and hurt like crazy for hours or days. So I have to be careful my posture and attitude are just right every time I perform. 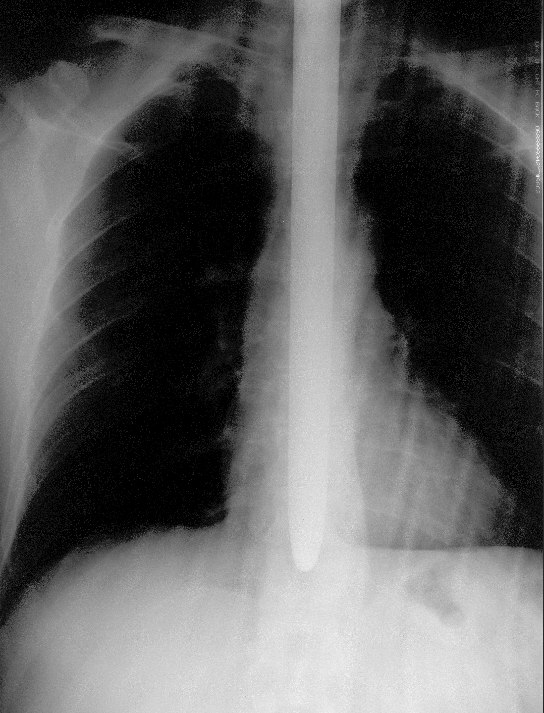 An X-ray of Dan Meyer’s chest with a sword. 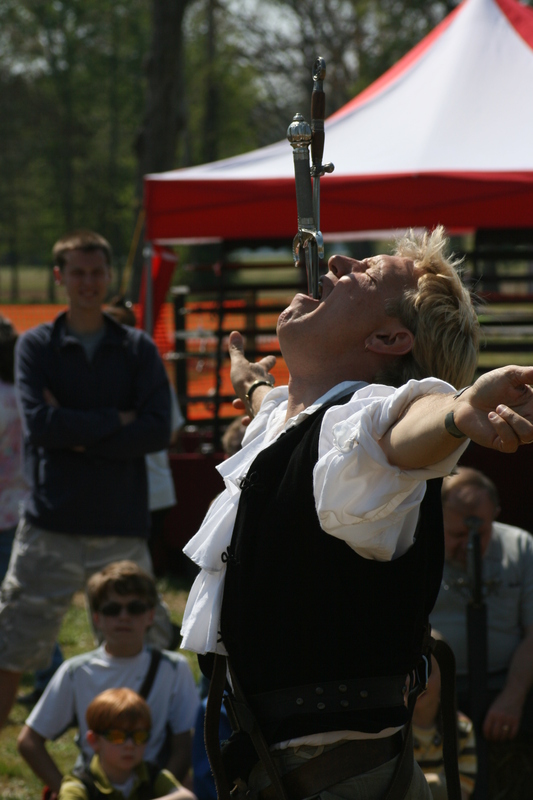 Are some people’s bodies better predisposed for sword swallowing than others? I had some things working against me, actually. My grandpa died from a constricted esophagus – he had to drink hot tea to open his throat. So I thought, there’s no way I can do this. I get the hiccups easily. But I looked at people who did it and thought, if they can do it, so can I. After enough tries, the body finally relaxes and lets it happen; your brain learns through deliberate practice to let it happen. That mental obstacle is even harder than the physical. Best part of your job: Watching the crowd at one of my shows move from non-belief to belief: The eyes and jaws dropping, the heads spinning. I love teaching the audience that they, too, are capable of doing the impossible in their lives. Most challenging part of your job: Getting the audience to believe that it’s not just a trick; sometimes they think my sword has a curved blade or something. I’ll have a volunteer push the sword in or pull it out of my throat, and I also use a glowing light saber that shines through my neck. That convinces the skeptics. By the time I’m done, 99.9% of the audience is convinced it’s real. What’s harder: Putting the sword in or taking it out? Putting it in. Your body is constantly trying to expel it. Amount of time you can keep it down: About a minute or so. Rituals to prepare before a show: Before each show, I get down on my knees and say a prayer. I try to remove my pride; the Old Testament says pride comes before a fall. It’s not about me, but rather about inspiring people to do the impossible. Does your stomach need to be empty? I’ll eat a full meal about three or four hours before performing.The sword goes deeper with a full or half-full stomach; with food, your stomach hangs lower and the esophagus stretches. I try to eat something easy to digest, though. Nothing spicy. Do bits of food – excuse the mental image here – ever come back up on your sword? No. Your esophagus wipes the blade clean. But I wipe mine down with menthol-flavored rubbing alcohol before and after each show. You mentioned swallowing swords in a shark tank and swallowing a red-hot sword. Any other insane feats? One time, I swallowed 21 swords at once. I’ve had someone yank the sword out of my throat using a whip. Last year, for Ripley’s Believe It or Not, I pulled a Swarovski crystal-encrusted Mini Cooper out of the Ripley’s showroom to Baltimore’s inner harbor – about 12 feet. Two cables were attached to the car on one end, and to my sword on the other. Not gagging was tough. Medical risks: Usually within the first several months or years of learning, you get something called “sword throat” from the abrasion and scrapes. Your body develops a tolerance for it. But there have been 29 deaths over 150 years associated with sword swallowing; a woman died at age 25 from just a quarter-inch nick in the throat. In 2005, I punctured my stomach while swallowing five swords at once, and I couldn’t eat solid foods for almost three weeks. I almost quit sword swallowing, but I had to film a documentary for the Food Network, so I got back in the saddle. How did your family react when they learned that the shy boy with a degree in music had become a professional sword swallower? My mom was a registered nurse, so she told me to stop. My dad was an X-ray technician, so he knew where the sword goes, and he didn’t like it either. But when they came to my show and saw the sold-out crowd, the standing ovation – they finally got it. They’re proud of me now. Does it get harder as you get older? How much longer do you think you’ll be swallowing daggers? It gets easier the longer you do it, so it’s fairly easy for me now. The oldest sword swallower is 76; he started at age 12, and his parents were famous sword swallowers. When I found out he’s still doing it, I figured I have another 20 years. Salary range: Everyone negotiates his or her own rates. But since it’s so rare and dangerous – we’re risking our lives several times per show, and medical bills can range from $50,000 to $75,000 per injury – most of us in the Sword Swallowers Association won’t take less than a few thousand dollars per show. Some of us even more. It’s extremely dangerous. There are fewer than 12 professional sword swallowers today, and 29 people have died from it. Don’t try it. You can learn more about Dan Meyer on his website, as well as on Twitter, Facebook and YouTube. Meet other No Joe Schmos who have done the seemingly impossible: the magician who lives in the Waldorf Astoria and the alligator wrestler. This entry was posted in Crazy jobs and tagged guinness world records, ripleys believe it or not, sword swallowing by Megan Hess. Bookmark the permalink. Thanks for writing a great article, Megan! Great job! Article on NoJoeSchmo.com on Sword Swallowing as a profession! Please share!